26-year-old Rashmi Ranjan Suna succumbed to dengue after being shunted from one hospital to another in Hyderabad. 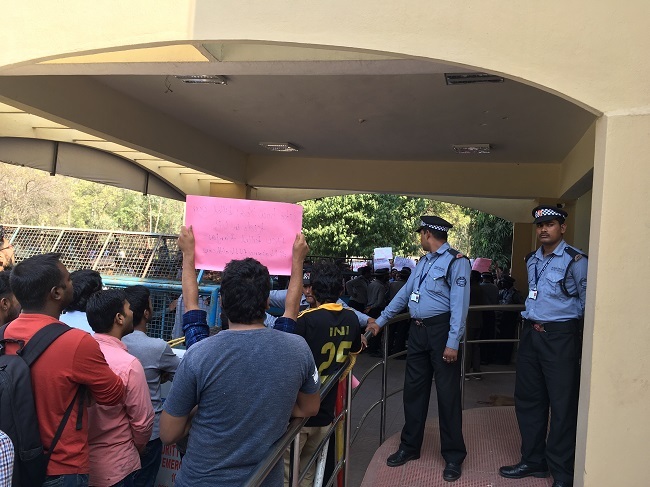 Anger spilled out at the administrative block of the University of Hyderabad (UoH) on Monday as students gathered outside the building and raised slogans against the varsity’s administration. The trigger was the death of 26-year-old Rashmi Ranjan Suna, who succumbed to dengue on Sunday after being shunted from one hospital to another in the city. Rashmi joined University of Hyderabad in 2013 for post-graduation. Soon after finishing his Masters, he began his PhD in 2015, and was in his fourth year of the programme. He was a first-generation Dalit scholar from Western Odisha’s Kalahandi district. He was getting the Rajiv Gandhi National Fellowship, and was the sole bread winner of his family. His father was an agricultural labourer who had stopped working after being diagnosed with a kidney disease. Rashmi belonged to the school of physics and students allege that it was a clear case of negligence. It was November 19 at around 1:00 am that the student reported to the university’s health care centre, that he was down with fever. The centre’s duty doctor reportedly told him that it was a case of viral fever and asked him to take rest. However, at around 4 am the same day, Rashmi complained of body pain. The doctor then referred him to Himagiri Hospital in Gachibowli, which was on the university’s list of referral hospitals, where he was admitted to the general ward. Subsequently he was shifted to the intensive care unit (ICU) as his health worsened. Despite asking for medical help soon after the onset of the symptoms, students say that the administration failed in diagnosing him successfully. Students allege that his health deteriorated further as he spent two days in the hospital, with the corporate hospital even conducting a blood test and saying that the patient tested negative for dengue. After spending two days in the hospital and showing no improvement in his health, Rashmi decided to leave the hospital and get admitted into another one. However, Himagiri Hospital allegedly asked him to pay Rs 34,000, refusing to wait for a claim being made for health insurance offered by the university, as the money would take one week to process. Subsequently, he was admitted to Citizens Specialty Hospital where doctors diagnosed him with dengue fever after a blood test. According to Rashmi’s friends, the doctors at the Citizens Hospital also started treating Rashmi based upon the earlier reports from Himagiri Hospital, but were shocked to see the results of the blood test. “The doctors at Citizen hospital also expressed their astonishment to find discrepancies in the test reports done by Himagiri hospital. After 48-hours of being under observation, on Friday morning, at around 9 am, the doctors informed us that multiple organs were damaged and there were signs of internal bleeding too,” said Shbranshu Shekar, a friend of the deceased. From then onwards, he was put on external life-support which reportedly cost around 1 lakh per day, he added. The hospital bills were exorbitant and Rashmi was unable to bear the expenses. Desperate attempts were also made to crowdfund the cost for the treatment on social media and through friends, but to no avail. “From top to bottom, everyone is involved, including the Vice-Chancellor. The health business is inducted into the University system. Until they approve insurance claims, nothing moves. 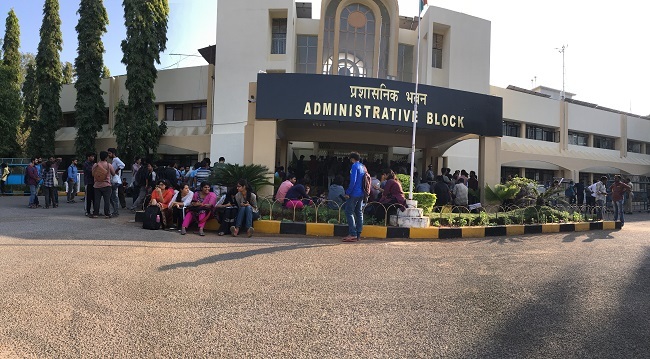 There is a very clear-cut nexus between the university administration and Himagiri Hospital, which has ultimately led to the tragic death of Rashmi,” says Dontha Prashanth, a student leader. At the protest site on Monday, students alleged that Himagiri Hospital was taking financial advantage of the health insurance policy accusing it of admitting any person from the university and charging high prices later. He said that there was a problem in claiming insurance and the hospital staff refused to let Rajeev leave. After that incident, the hospital was blacklisted. Now, the students are questioning why it was added back to the referral list of hospitals. Many students alleged that the university health centre was severely under equipped, only giving away pain killer tablets and cough syrup, with everything else being referred to corporate hospitals. “On the first day that we complaint of fever or any other symptom, they prescribe a basic pill. If the same person comes again, they will refer the patient to corporate hospitals despite having equipment and 10 to 20 beds,” alleges Saarthak, a research scholar. Speaking to TNM, University of Hyderabad’s official spokesperson Prof. Vinod Pavarala said that the committee would look into allegations and procedural lapses on how Himagiri Hospital was put back on the ‘white-list’. According to sources, the administration is also considering the students' demand to file a case against Himagiri Hospital. However, it was not clear if the university is going to pay any compensation to the victim’s family, despite the demand by students for Rs 25 lakh. Meanwhile, the day-long protest continued until late in the evening, with some students who gheraoed University Registrar being detained by the Gachibowli police and later released.